Safway’s QuikDeck® Suspended Access System means more space to work and less installation time. Working under a bridge doesn’t mean you should be working overtime. 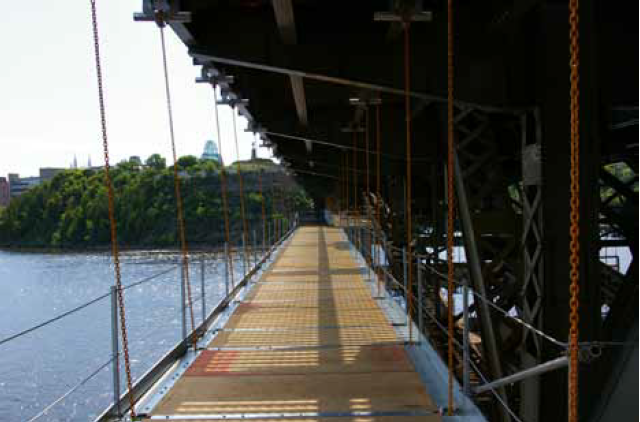 When contractor Pomerleau needed a lightweight, reliable access system to rehabilitate the fragile Alexandra Bridge, they chose Safway’s QuikDeck® Suspended Access System. “We needed a fast and reliable system that could be versatile to suit the different conditions of the existing bridge structure,” said Philippe Goulet, Pomerleau Project Manager. QuikDeck® could tackle the access challenges, as well as provide a flat, open workspace that was easy to install. The crews using the scaffold considered the open work area to be extremely beneficial, as it allowed for easy movement of personnel and materials. “Workers do not have to work in a confined space, which allows a safer workplace and less loss of time due to material movement on the platform,” Goulet said. Once erected, various trades used the scaffold, including formworkers, steel installers, masons, painters and inspectors. Just over a third of a mile long, the Alexandra Bridge connects the Canadian provinces of Ontario and Quebec. In total, the bridge consists of two lanes and one sidewalk. Approximately 15,000 vehicles, 1,300 cyclists and 2,000 pedestrians cross the bridge per day: the highest use of all interprovincial bridges by cyclists and pedestrians. After onsite training provided by Safway’s Training Department, Pomerleau’s installation crew of eight erected the equipment 100% below the bridge deck. No special traffic or pedestrian control measures were necessary. Gaining good access to the piers’ stepped truss required a “stepped” QuikDeck® (see photo, above). Stepping the platform to match the slope of the truss yielded a safer, more productive worksite. “We estimate that we cut the installation time in half by using the QuikDeck® system in lieu of a traditional scaffold,” Goulet said. Ontario and French-Canadian in Quebec. Safway’s Hamilton branch and Bridge Division coordinated efforts to design a safe solution that adhered to construction regulations in both provinces. Training was provided in French-Canadian using translated QuikDeck® documentation. The drawings for the job were reviewed and stamped by both an Ontario and Quebec engineer. The result was a custom engineered solution that provided access to the slope of the bridge’s pier (see photo, front page). QuikDeck® is expected to remain in place for approximately two years.